Carbon dioxide (CO2) emissions from electricity generation totaled 1,925 million metric tons in 2015, the lowest since 1993 and 21% below their 2005 level. 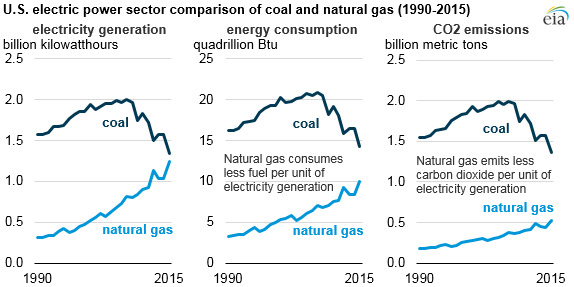 A shift on the electricity generation mix, with generation from natural gas and renewables displacing coal-fired power, drove the reductions in emissions. In recent years, the drop in natural gas prices, coupled with highly efficient natural gas-fired combined-cycle technology, made natural gas an attractive choice to serve baseload demand previously met by coal-fired generation. Considering both the higher thermal efficiency of generators and lower carbon content of fuels, electricity generation using natural gas emits roughly 40% of the carbon dioxide that would be emitted from a coal-fired unit producing the same amount of electricity. Renewable energy sources are gaining an increasing share of generation, driven primarily by increases in wind and solar capacity. Nuclear generation was relatively flat over the past decade but remains the single largest source of generation without CO2 emissions. Together, renewables and nuclear provided about 33% of overall U.S. electricity production in 2015, the highest share on record.